As the hardreading staff has noted on numerous occasions, the Boston Herald has routinely employed its kissin’ cousin, Boston Herald Radio, as a launching pad for stealth marketing. The digital broadcast platform, which boasts up to several listeners daily, is a convenient venue to interview advertisers, providing content that the Herald has reprinted with diminishing disclosure. It’s no accident that you can barely read the “Sponsored Content” disclaimer at the top of the page. That’s how stealth marketing works best. Now, however, the sneaky local tabloid has gone one step further with its ads in sheep’s clothing, as evidenced by page 3 of today’s edition. To be clear, both sides of that page are advertisements, despite this attempt to make the left-hand side seem just like a regular interview. 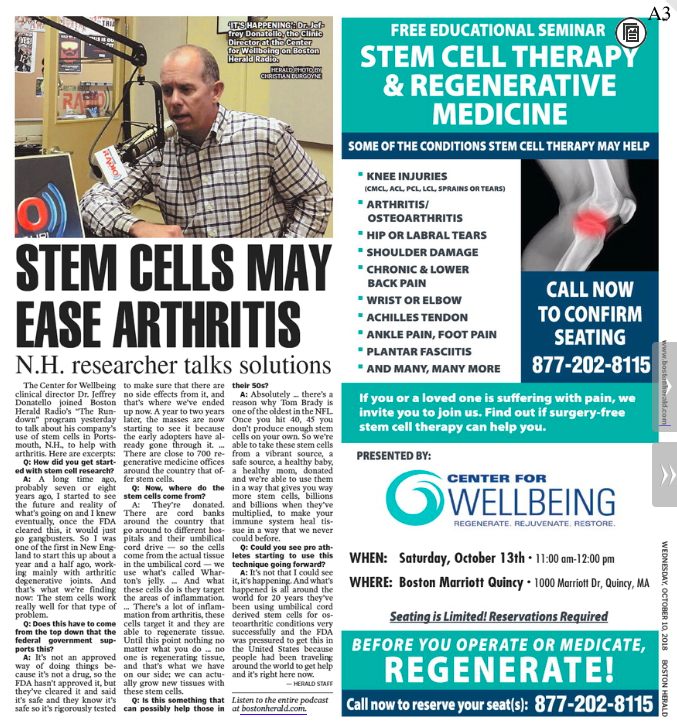 The Center for Wellbeing clinical director Dr. Jeffrey Donatello joined Boston Herald Radio’s “The Rundown” program yesterday to talk about his company’s use of stem cells in Portsmouth, N.H., to help with arthritis. Here are excerpts . . . But that doesn’t excuse the lack of disclosure in the print edition, which a lot more people will see. Moral of the story: When it comes to the stealthy local tabloid, caveat reader. As the hardreading staff noted the other day, the Boston Herald has of late increased the amount of its “sponsored content” while decreasing the legibility of its disclosure. To be sure, sharp-eyed observers will pick up that it’s actually an ad, but not everyone is as perceptive as you, splendid reader. For some, anything with a headline and a byline qualifies as editorial content. Which is exactly what stealth marketing counts on. Regardless, we’re guessing that the revenue-impaired Globe and the bankrupt Herald will increasingly turn toward this sleight-of-ad as time goes on. We hope, of course, to be proven wrong. The sneaky local tabloid just keeps getting sneakier. 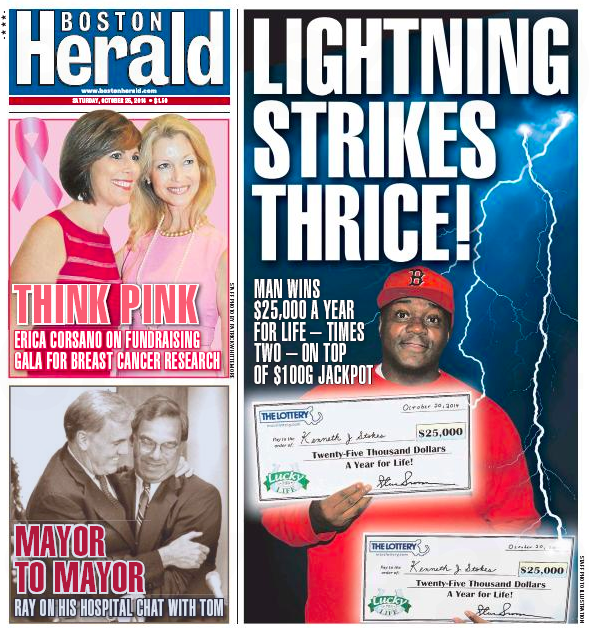 As the hardreading staff has noted on multiple occasions, the Boston Herald’s publication of stealth marketing (a.k.a. “sponsored content”) has steadily become more and more – ah – stealthy, as the labeling of same grows smaller and smaller. For example, here’s how sponsored content for intimate apparel retailer Rigby & Peller was labeled in March of 2016. 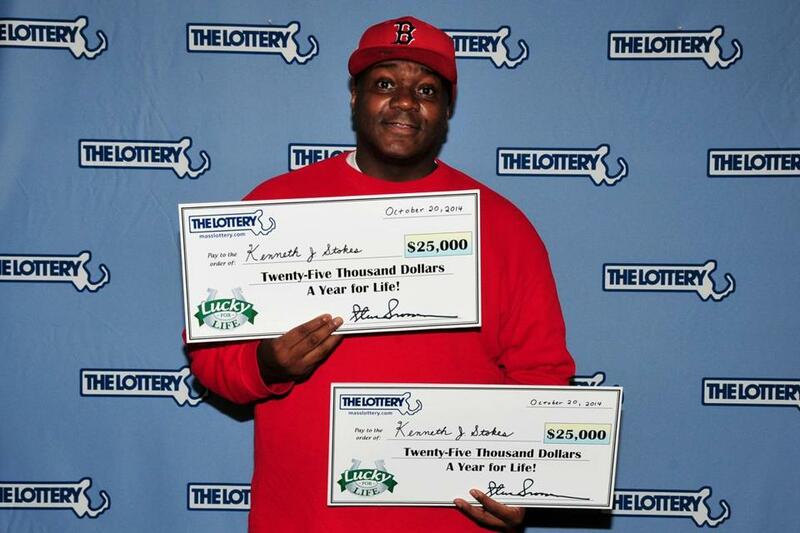 Then there’s this advertorial for the Massachusetts State Lottery from a year ago. Do we detect a pattern emerging here? All of those ads in sheep’s clothing originated in interviews on Boston Herald Radio, which has up to several listeners but which more importantly provides the Herald with a steady stream of stealth marketing opportunities. Given the Local Dailies DisADvantage the thirsty local tabloid labors under, that just might be the best it can do. The Boston Herald has never been shy about mixing promotion and news content, as the hardreading staff has routinely noted. But the stealthy local tabloid is getting bolder and sneakier about it at the same time. Notice especially what’s discretely tucked away upper left. 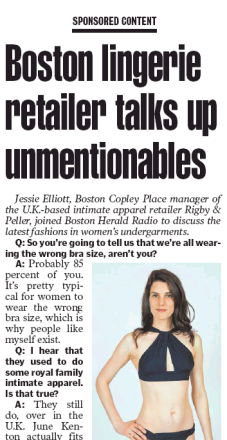 Obviously, U.K.-based intimate apparel retailer Rigby & Peller bought a twofer from the Herald: that print piece and an interview on Boston Herald Radio, a streaming audio service that up to dozens of people hear each day. To be fair, the Q&A is labeled Sponsored Content, as is the website version. But . 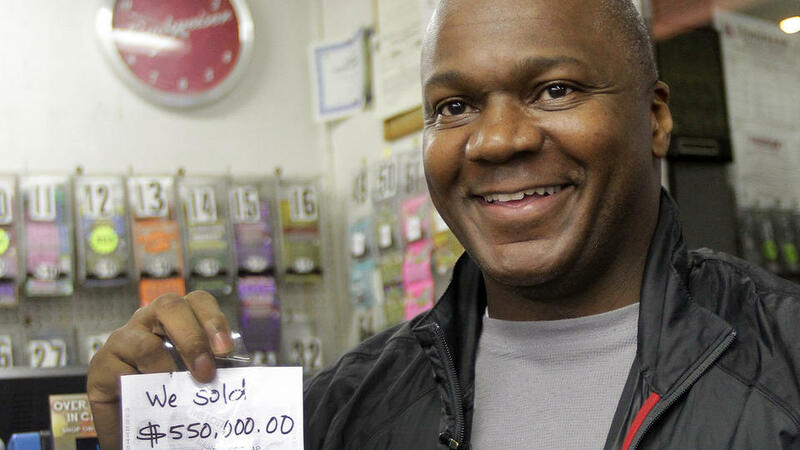 . . on the Herald homepage it is not labeled. We’re guessing the radio interview wasn’t tagged as a paid promotion either. So awkward. As the hardreading staff has noted in detail, the Boston Globe has of late been leasing out editorial content to paymates of various stripes, from Rockland Trust to Suffolk University to Steward Health Care System. 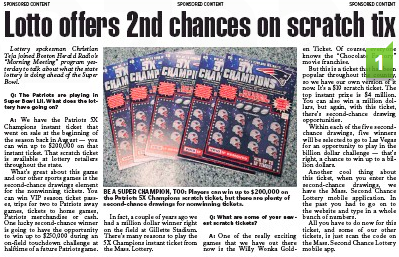 And now, not surprisingly, the stealthy local tabloid wants in on the auction – in this case via Boston Herald Radio, the streaming audio service that up to dozens of people listen to. The frosty (cashword) local tabloid has often run excerpts from BHR interviews alongside its daily promotional ad. 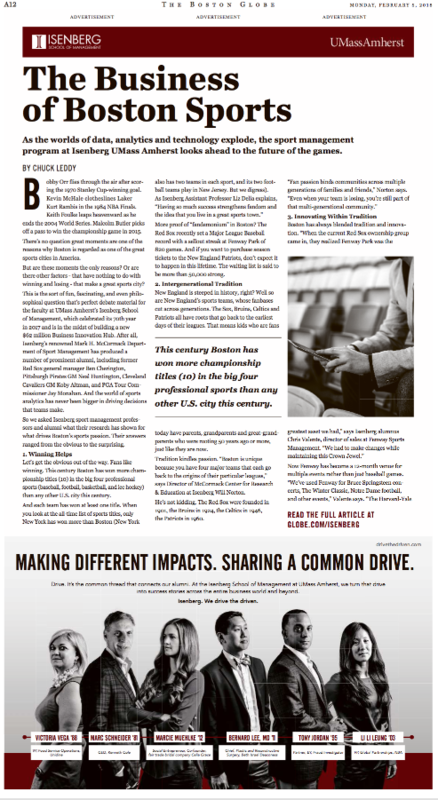 But this is the first time the interview is “Sponsored Content” – that is to say, an ad itself. We get it that newspapers have to come up with creative ways to generate revenue, which is one reason all this sponsored content is suddenly popping up. We’re just wondering if there’s any bottom to that well.